This type of bit uses seismic grade tungsten-carbide as the cutting media. Tungsten-carbide does not possess the hardness of diamond and as such has a limited range of application as a core drilling cutting media. Tungsten-carbide bits are however a very cost effective means of drilling softer unconsolidated formations. 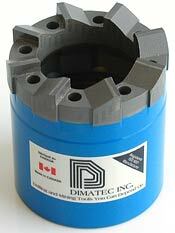 There are two types of tungsten-carbide bits produced by Dimatec: the “carbide-chip” and the “saw-tooth” types. These bits are set with large, rectangular-shaped tungsten-carbide elements that are physically embedded into the crown of the tool. The bit face has an aggressive saw-tooth pattern with either integral canal type waterways or with optional cylindrical-shaped face-discharge ports on thick-kerf wireline core bits. The bit crown itself is composed of a tough, wear resistant metal-bond matrix material. The gauge diameters of the tool are also heavily set with tungsten-carbide wear pads. The application of this type of bit is primarily in geotechnical soil investigation or for core drilling in overburden layers that are composed mainly of clay, sand, gypsum or soft shale. The cutting media used in this type of core bit are crushed tungsten-carbide chips that are suspended in a metallic alloy that is fused to the steel body of the tool. Typically, these tungsten-carbide chips have a granular size of 0.08 to 0.20 inch (2 to 5mm) and have a totally random orientation within the bit crown. The face profile is somewhat irregular and the waterways are of the standard canal type (Style “W”) design. This type of core bit has considerably more cutting edges than the “saw-tooth” variety and as such have a wider range of application that includes slightly harder sedimentary formations. 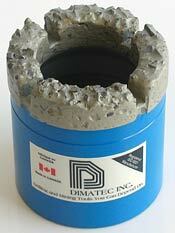 Carbide-chip core bits are also frequently used to clean steel fragments out of existing drill holes. Carbide-chip core bits are similar to impregnated diamond core bits in that the bit crown is composed of several layers of cutting media. 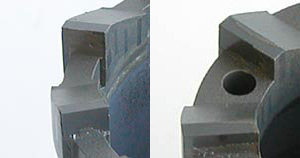 The bit face regenerates itself with new cutting edges by wearing away the metallic alloy during operation to continually expose new layers of carbide-chips until the bit crown is consumed.